Beer Lovers! This is your chance to spend some quality time with your favourite drink. An eclectic atmosphere with live music, fellow beer lovers and the best of beers from around the world, you wouldn’t want to miss this chance to Chug ‘em all down. The Beer Circus Goa 2017 is a two day #ChugChugFest co-organized by yours truly, Lokaso and will be held on 4th & 5th of November 2017 at the beautiful Stone Water Eco Resort in Bogmalo, Vasco da gama. It will be a grand affair where everyone gathers to celebrate some of the finest brews and mouth-watering treats along with some amazing live performances by talented bands from all around the world. 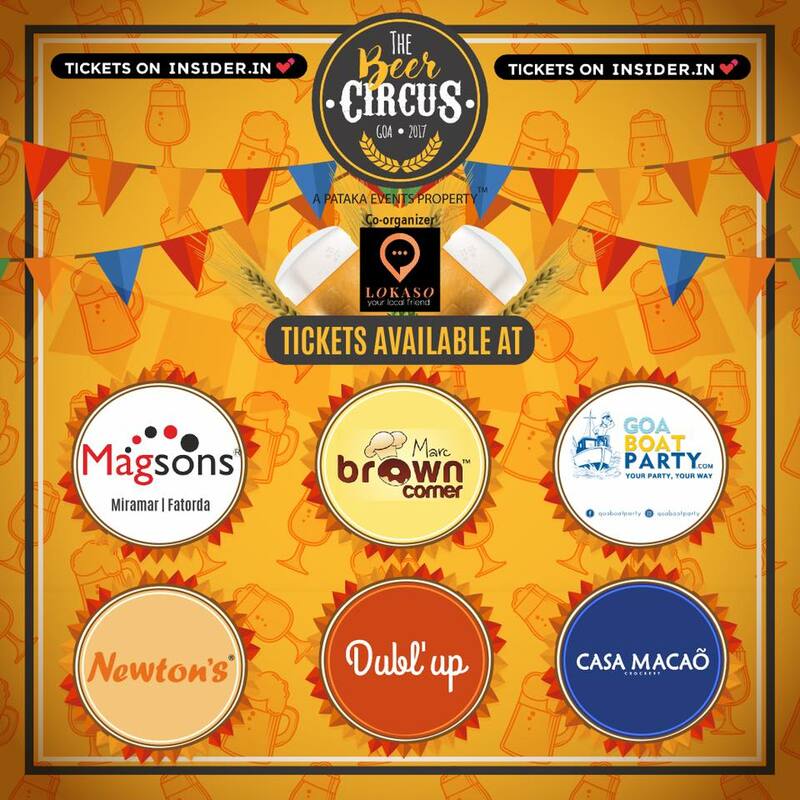 Where to get the tickets to Beer Circus Goa 2017 ? Here’s a list of places you can avail your tickets at! Magsons Superstores Goa, Goa Boat Party, Casa Macao and Newton’s Supermarket. Can’t make it to any of these places? No sweats! Just book your tickets online from Insider.in or the Dubl’up app. If beer doesn’t make you happy then take a look at what’s more in store for you at the Beer Circus Goa 2017. We’ve sure got you sorted for the weekend. Who wouldn’t enjoy some good music with a beer in your hand? With 10 hours of live music, The Beer Circus Goa 2017 will host bands of different music genres like African Folk, Reggae Dub, Jazz, Blues Rock and many more. Around 8 Uptempo / Groovy Dance bands, both Indian and International, will also be present to up the level of entertainment and make this event a grand success. One of the most interesting areas at the Beer Circus is the Brewniversity. Update your knowledge on the making of different types of brews and beers, participate in beer tasting sessions and learn from the experts at the Brewniversity workshops. Bet you haven’t got a chance to do anything like this before in Goa! Gracing this amazing workshop, will be John John Eapen, a well-known Beer evangelist who’s quite popular in the Beer Fraternity around India. Yeah, You heard it right! All you Beer lovers can now put up your own beer stalls and show your love for beer by combining it with other delicacies available in the festival. Your stall can also be some cool and funky beer inspired merchandise like t-shirts, home decors and everything beertastic. Froth INN is a creative concept by The Beer Circus Goa 2017 wherein the attendees can stay in a luxurious log house with all room requirements fulfilled. Room packages are available on their website. So, here’s the million dollar question, would you want to miss a festival where you can eat, drink beer and dance to amazing music all day long? No? Then why wait book your ticket now! Still got two minds on why you should be at The beer circus Goa 2017? Simply comment your questions below or just Whatsapp us on +91-9112010709. We at Lokaso are happy to help! Catch the latest updates Beer Circus Goa 2017 co-organized by Lokaso on our facebook page or TBC’s handles given below. For more hot buzz about parties and events happening in Goa, download Lokaso app and never miss another local update.